In the early 1950s P.C. Dent lived in one of the two police houses on Halliday Hill on the Northway Estate, and in the mid-1960s moved to Headley Way. Some extracts from his memoirs relating to Northway and Headington are reproduced below. We had only been married a few months when, much to our surprise, we were allocated a police house at 19 Halliday Hill on the Northway Estate. We went there and found the estate was only partly built with hard-core pavements and roads. It was to be a year before they were surfaced. We were given a date to move in, and hired a van to bring our few bits and pieces. The house had concrete floors covered with brown Marley tiles. There was a front room, dining room, and kitchen with larder and a built-in cupboard. I remember that if anyone left the drawer of this cupboard unit even slightly open it projected in front of the door from the dining room, preventing it from opening. There was a gas stove and a gas copper fitted in the kitchen. We had a back boiler in the front room fireplace and even a built-in gas poker. There was a radiator in the dining room and, as well as the usual airing cupboard, there was another for drying my cape. We bought some sacks of coal, which were delivered to the coal store outside the back door. We bought a small mat to put on the floor in front of the fire but had nothing to sit on except dining room chairs. I went to a shop down the Cowley Road and bought two fireside chairs on hire purchase. We had scraped together some curtains and I remember we sat there in front of a roaring fire, which was burning our legs, and there was a terrible draught freezing our backs. When we could scrape together enough money we bought some thick material and made a door curtain. It was a semi-detached house and the other half was occupied by PC Philip Gould and his wife Joyce. There was a police box (a sizeable room) built on to the side of my house, but it was never furnished or used. Of course, we had no telephone. The garden was just a mound of clay and the house, having been built on a corner, was open front and side. There was just a low wall running round what was to be a garden. It took a long time and much hard work levelling the garden, which sloped with the hill. I did the large side garden in two sections. I grassed the top one and planted potatoes in the bottom one as I had been told that this was good for breaking up the clay. I also tried ash, sand, and seaweed mixture, but to no avail…. Council housing was mainly on the basis of how many children people had, and this meant that every council house estate as it was built was full of young children who, in time, would become teenagers, some of whom later on would become a big problem. Not long after moving in I received complaints that small children were wandering out through the hedge on to the Northern by-pass. I reported this to the Chief Constable and, within a very short period the City Council closed off the estate from the A40 with the erection of iron railings. Lots of trees were planted on the estate and it was a full-time job, both on and off duty, preventing these from being damaged. We were all very pleased with the survival of the very large chestnut tree which was planted as a sapling on the roundabout opposite our house. Quite a large number of police houses were built as a means of helping police recruitment. They were of course tied houses, which meant that if you left the Force you had to leave the house. This is why in various parts of my memoirs you might think why put up with this or that? The reason was we had nowhere else to go as we did not have enough money to put down a deposit on a house. As I have previously mentioned, council houses were allocated to those with the most number of children, and there was a very long waiting list…. For some reason our house became the village police house with one major difference, we had no telephone. Everyone who came knocking at my door when I was off duty I had to deal with. When I was on duty my wife was suffering abuse when callers found I was not at home, and she was being involved in all sorts of disputes. I know of one occasion when she threatened to hit a caller at the door with the children’s cricket bat because he was being abusive. I remember a man in Stainfield Road calling one evening and saying that he couldn’t get into his house because there was an Alsatian dog sat on his front door step. I told him to get hold of its collar and drag it away. He said it might bite him and I remember asking why he thought it wouldn’t bite me. He said ‘You’re the policeman aren’t you?’ This was the general attitude with some people. I was called out of bed in the middle of the night once to round up gypsies’ horses that were running around the estate. My wife was involved on another occasion with PC Gould from next door in rounding up stray cattle. I was even knocked up at 1.00am one morning by a woman who had lost her purse. One day I was off sick with influenza, and was just getting over it when I was called to a house in Stainfield Road where a man had committed suicide. I went in there and found a man sitting at the table, slumped forward with his head on his hands. Resting on the table in front of him were his war medals. In the dining room was a poor old budgerigar upside down with its feet in the air. The place was full of gas, which was lethal in those days before the changeover to North Sea gas. On another occasion I was called out over the fields off the estate where the dead body of a man was by a tree. He had shot himself with a pistol. I had either to cycle down to Marston or get someone else to do it to contact the Police Station. I think we eventually got a telephone installed in about 1959 or 1960 following what could have been a serious assault on my wife on our doorstep, when she was rescued by two men living on the estate. As our two children grew up they were subjected to a lot of abuse and harassment because I was a policeman. Our children used to invite others into our garden to play. On one occasion my wife heard a woman shouting out her daughter’s name and telling her to get out of the garden and stop playing with those ‘bloody copper’s kids’. Any minor thing our children did was reported to us as though it were a serious crime. Virtually anything was complained about. I often wonder how much they had to put up with because of my doing my job…. When we first moved into the house there were two concrete clothes line posts in the back garden, but no path. We could not afford the materials to make a concrete path so I used the clinkers from the coal fire to make a rough one. 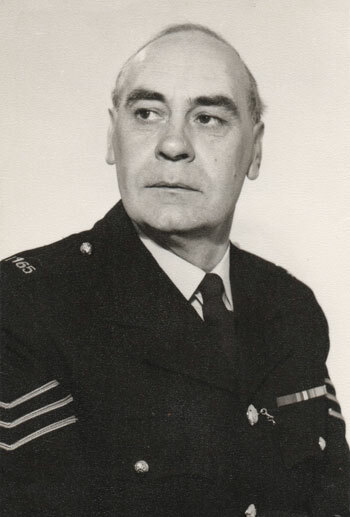 One of the Chief Inspector’s jobs was to inspect the police houses periodically. There was obviously a flaw in the cast-iron fire basket, which had split, and I put in a memo to the Chief Constable for it to be replaced. Along he came, looked at the fire basket, and accused my wife of causing the damage by not raking out the ashes properly from underneath the fire basket. He then spotted my cinder path and told my wife that she was wasteful and that his wife always sieved the ashes and put the clinkers back on the fire. Later when the bottom of the cheap dustbin, which the police had supplied, had rusted through, along he came to inspect it and accused my wife of burning rubbish in the bin, which she had never done. These are just a few examples of the attitude whenever I reported any fault to the property. Once every year the Chief Constable would go round with the Policewoman Sergeant and Superintendent or Chief Inspector and inspect all police houses from top to bottom. It was not unknown for them to open cupboards and drawers. If the house was not considered to be up to standard in cleanliness and tidiness, then it would be the job of the Policewoman Sergeant to give your wife the necessary tuition. After moving to Northway Estate I began to get a lot of duty postings to Headington. I paraded at Headington Police Box, which was attached to a police house occupied by Inspector, and later Superintendent, Len North. This was on the London Road opposite Headley Way. It had a police flashing light, like most Police Boxes. There was a small gas fire with a gas ring on top at the far end of the Box. This room was narrow, with just a wooden bench and a chair with a built-in desktop for writing. The first thing I learned about this Box was that in winter if you bent down in front of the gas fire, turned it on, and struck a match there was a loud bang and you lost your eyelashes. If ever we showed a recruit round the Beat in Headington in winter, we always let them light the fire and, for some reason, thought the subsequent reaction to be quite funny. The more experienced of us would turn it on and stand back whilst throwing lighted matches at it until it lit. You could sometimes get two or three PCs squeezed into this little Box for their meal break in the middle of the night. The conversation and laughter could, at times, get quite loud which would wake up the occupants of the house who, understandably, would be quite annoyed…. One day I was called into the Superintendent’s office to meet a member of the City Council’s staff. He complained that various shopkeepers on the London Road at Headington had taken over the pavement as part of their premises, and were obstructing the footpath with their goods. I was instructed to deal with this as soon as possible. This was a typical example of how, once you removed the patrol from an area, and the responsibility for it from the officer on that patrol, people take advantage. I went round warning all the shopkeepers of the complaint and the law relating to obstruction of the pavement. As this made no difference, I put PCs on this daily and they were ordered to book any offenders. As a result, I became very unpopular in the area in which I did my shopping. At one greengrocer’s in particular my wife was blacklisted and they refused to serve her.